With the introduction of Fusion Cross, a new era in inserting technology has begun. No other system is as flexible or handles such a wide spectrum of envelope formats and filling thicknesses at such high speed, while still being reliable and gentle on the material. Together with the high degree of automation and the accompanying fast job changeovers, the Fusion Cross is the perfect machine for every inserting application – whether in transaction or direct mail. With this intuitively operated high-performance inserting system, you are fully equipped for all requirements in a mail production center – now and in the future. The required integrity is ensured by intelligent system control and monitoring along with continuous document tracking throughout the production process via the connection to our powerful software. No other high-performance inserting system is as flexible and processes as broad a spectrum of envelope formats as Fusion Cross. This revolutionary system can handle both small formats like B6+ or #7 3/4, as well as large formats like C4, B4 or Flats without any difficulty. Even at high speeds, Fusion Cross can meet all the diverse requirements of the production mail center perfectly. Quick set-up times and easy changeover between different formats round off the Fusion Cross portfolio. 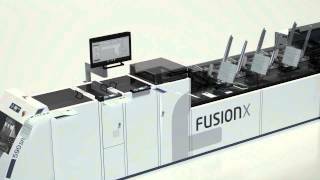 Fusion Cross bridges the gap between transactional and direct mail: high-integrity processing of important documents and non-standard enclosures while retaining the highest productivity. Thanks to its unique inserting principle and the variety of enclosure feeders, this inserting system can process an extraordinarily broad range of enclosures with the highest possible output. No material is too difficult for the Fusion Cross and its enclosure feeders. No matter if it is thin, thick, rigid, smooth, folded or unfolded: this inserter processes a wide range of enclosures up to 15 mm and 1 kg absolutely reliably. Furthermore, with its open device carrier concept, which allows for free configuration and easy changeover between various enclosure feeders, it also offers the highest possible flexibility. The intuitive control software BÖWE Cockpit makes it easier to prepare and process the orders, automatically carries out format changeovers, and significantly shortens the changeover times. A comprehensive management information system allows an exact production analysis, right up to monitoring every letter processed. And all of that with a simple and intuitive operating interface, based on smartphone apps. Fusion Cross systems can be interconnected. Job and material descriptions are thus available at the same time on other machines of this type, the systems automatically adapted to the respective applications. The small-batch processing software also has a rationalizing effect. 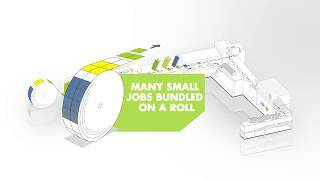 It allows many small jobs to be bundled on a roll of paper and to be processed with high efficiency. 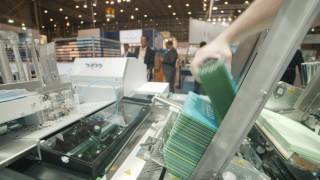 Transaction and direct mail service providers today wish for greater automation as this offers new growth opportunities. Integrate and automate upstream or downstream work steps that have been carried out separately and manually until now, with the help of further BÖWE SYSTEC technologies that are available for the Fusion Cross inserter. High-performance input channels in flexible configurations for the most diverse assembling, folding or stapling applications, modules for variable color envelope printing, sorting functions or integrated post box systems expand the functions of the inserting system, and reduce the need for additional special machines and staff. Do you want to know more? We look forward to your call or E-Mail.